The current' NHS reforms' being secretly rolled-out across England are founded on U.S. insurance-based private Healthcare models designed for profit, not patients. The NHS is funded by the State via general taxation, it employs hundreds of thousands of people and keeps the whole population healthy thus enabling them to contribute to the economy. It is an alternative to the Insurance based U.S. healthcare system which drives many into bankruptcy, frequently provides extremely inadequate cover, only covers those that can afford it, generates maximum profits from sustaining suffering and pain and ultimately leaves many unable to contribute to their country's economy. Having a State funded National Health Service used by everyone also allows for the government to receive very fast and reliable statistical information from which useful medical information can be obtained. If the USA were to implement such a service, as a replacement for their outrageously expensive schemes, then they would benefit from having a much healthier population, higher tourist revenue and a significant reduction in the number of unemployed that have to endure the nightmare existence of living on welfare. But a completely 'healthy' population generates no profit for those in the healthcare 'industry'. The healthcare industry in the UK, and of course in England, is the largest of all industries which is WHY the NHS is under attack from the private sector, who for decades have been lobbying successive governments to denationalise the NHS and introduce more of the private healthcare sector. The current secret plans proposed to 'transform' the NHS in England are based on a document titled 'Five year forward view' co-authored by Simon Stevens, the ex Vice President of the U.S. based UnitedHealth, one of the largest private insurance-based healthcare companies in the world. Stevens was appointed boss of NHS England by the health minister Jeremy Hunt. Steven's has recommended the secretary of state for health (Jeremy Hunt) adopts the U.S. models of care in England, and has told all healthcare authorities in England to come up with 'Sustainability & Transformation Plans (STP) in-line with the U.S. model based 'five year forward view' document. If National Insurance (N.I.) contributions aren't enough to sustain our NHS, then why haven't the government proposed to increase contributions? even 1p would help massively. If private finance initiatives (Pfi) are crippling hospital finances, then why haven't the government offered alternative solutions to settling the finances? (there are many available). The answer is simple. They do not want a publicly-run 'national' Health service. In fact, to many Tories the thought of any infrastructure being 'publicly run' is repugnant and will not be tolerated. Jeremy Hunt is one of these and openly published his vision of 'denationalising' the NHS in a book titled 'Direct Democracy'. 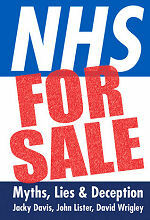 The current global misconception that the NHS was introduced to benefit the people is very difficult to alter. In reality the NHS was created not just to benefit the people but also our country's economy, which is something that it does 'extremely' well. In any insurance based health-care system, a citizen is only a broken leg away from bankruptcy, with a subsequent life of absolute poverty. Links to articles mentioned in this post..